For bridges used by boats, see navigable aqueduct. For water supply, see Aqueduct (water supply). For physics water bridge (water thread), see Water thread experiment. Pont du Gard, France, a Roman aqueduct built circa 40-60 CE. It is one of France's top tourist attractions and a World Heritage Site. Bridges for conveying water, called aqueducts or water bridges are constructed to convey watercourses across gaps such as valleys or ravines. 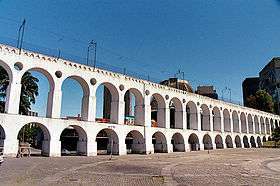 The term aqueduct may also be used to refer to the entire watercourse, as well as the bridge. 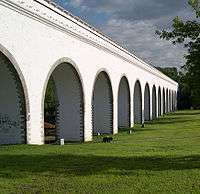 Large navigable aqueducts are used as transport links for boats or ships. 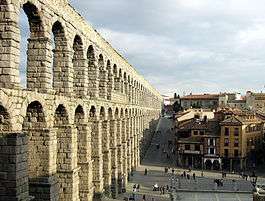 Aqueducts must span a crossing at the same level as the watercourses on each end. The word is derived from the Latin aqua ("water") and ducere ("to lead"). 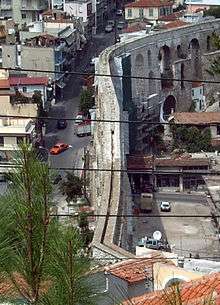 A modern version of an aqueduct is a pipeline bridge. 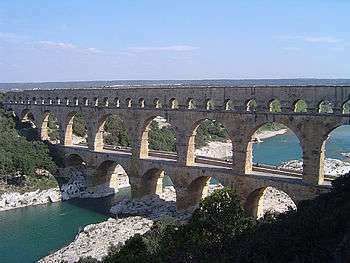 Although particularly associated with the Romans, aqueducts were likely first used by the Minoans around 2000 BCE. The Minoans had developed what was then an extremely advanced irrigation system, including several aqueducts. In the seventh century BCE, the Assyrians built an 80 km long limestone aqueduct, which included a 10 m high section to cross a 300 m wide valley, to carry water to their capital city, Nineveh. 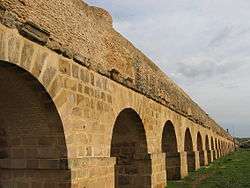 Bridges were a distinctive feature of Roman aqueducts which were built in all parts of the Roman Empire, from Germany to Africa, and especially in the city of Rome, where they supplied water to public baths and for drinking. 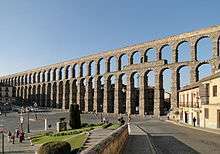 Roman aqueducts set a standard of engineering that was not surpassed for more than a thousand years. Navigable aqueducts, also called water bridges, are water-filled bridges to allow vessels on a waterway to cross ravines or valleys. 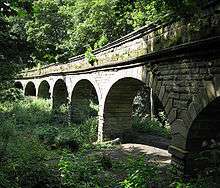 During the Industrial Revolution of the 18th century, navigable aqueducts were constructed as part of the boom in canal-building. A notable revolving aqueduct has been made on the Bridgewater Canal. This allowed vessels to cross at high and low levels while conserving water (compared to building locks). 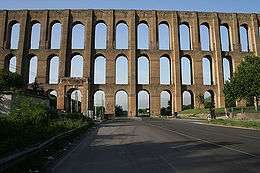 Wikimedia Commons has media related to Aqueduct.